The workshop will be followed by 6 days of riding from the mountains to the beach on the Barking Horse Farm Jungle River Trek. There is still space available if you would like to join us for David’s workshop and this cultural riding adventure through parts of rural Costa Rica that most tourists never get to experience. Workshop and riding vacation can be attended separately or together as a package. Slideshow photos taken during Barking Horse Farm organized events that took place at Establo San Rafael and Discovery Horse Tours over the past 6 years. 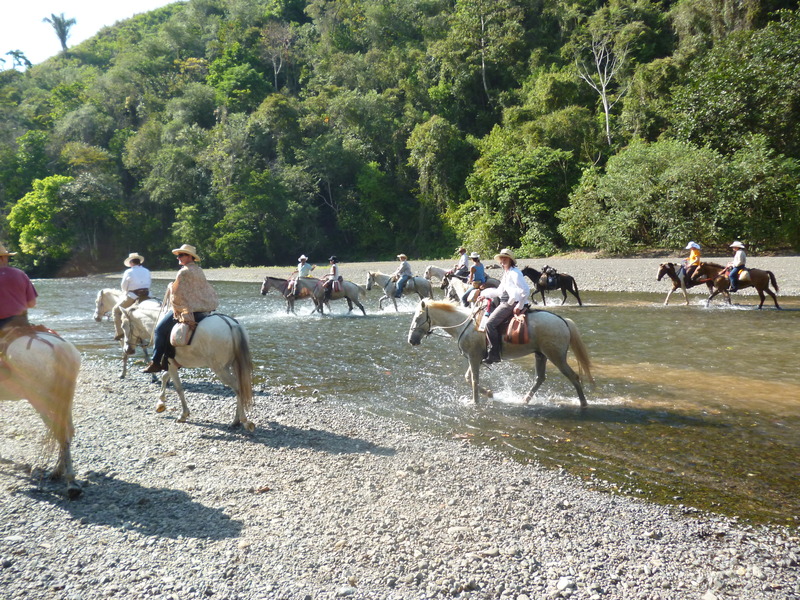 New Information about our Horseback Riding Vacations! Farm based riding vacations allow you to ride as much or as little as you like. Our nine different trail rides range in length and in dificulty. You can schedule your rides to fit your mood of the day. Farm based riding vacations are perfect for groups composed of riders of varying levels. 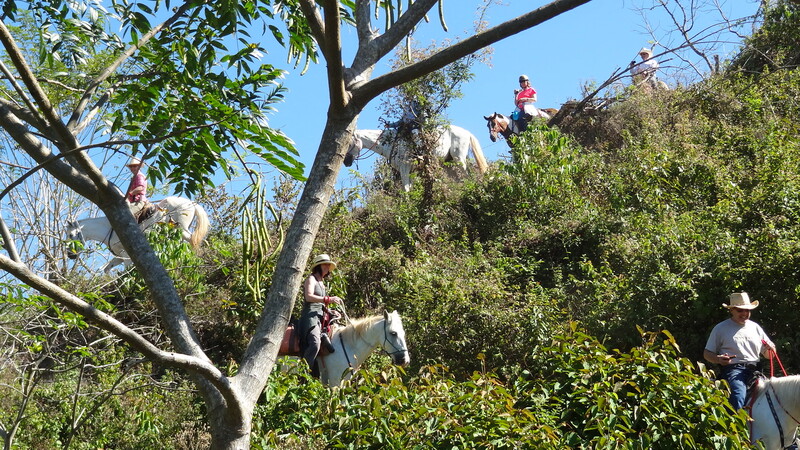 You can go on an easy ride in the morning with the whole group and the advanced riders can either continue on or take another more challenging ride in the afternoon while the rest of the group enjoys the farm or the nearby waterfall. Traveling with children who ride? That’s great! We have the perfect ponies for the little ones so they can enjoy the riding too. Don’t feel like riding one day? or are you traveling with a non rider? Don’t worry. There are lots of other attractions in the area and a short walk away there is a waterfall and swimming hole to enjoy. Traveling with children too young to ride? We can provide an experienced baby sitter while you are on your ride. Your children will love our farm animals; goats, chickens, ducks, geese and rabbits as well as dogs and cats. During your stay you will wake up to the sound of tropical birs while you stay in our Rustic Farm House or in our Dream Catcher Tree House. This is a riding vacation different from all the rest. 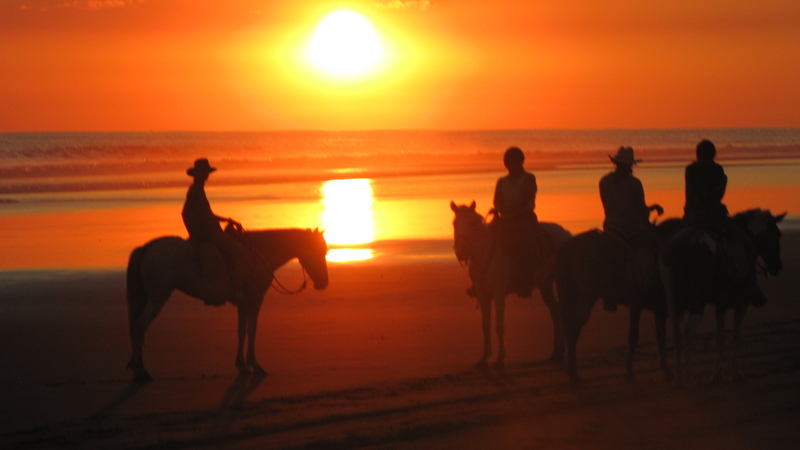 It is a journey for the experienced rider who wants to partner with their horse as they travel, day by day, for 5-7 days, into the heart of rural Costa Rica. On this trip you will experience Costa Rica’s natural beauty and the life of the Ticos up close and in a way that most tourists never get to see. We have three different treks to choose from. With all the three of these treks, each day is different from the last as you travel through a variety of ecosystems, from the mountains down to the beach. On the Rainforest Trek you visit working farms, National Parks and a Canopy Zip Line. On the Jungle River Trek, you experience true wilderness areas as you follow the Rio Tulin from its headwaters all the way to the ocean. On the Nicoya Eco Beach Trek you will see monkeys, ride three of the days on beaches, and sleep in the comfort of 3*-5* hotels. These riding vacations offer you the best of both worlds. Experience the rugged mountains of Puriscal County, the tropical beauty of the Rain Forest, and choose between the sunny, pristine beaches of either the Carribean or Pacific coasts. Similar to our multi-day treks but without the long days in the saddle we transport you from place to place in a private vehicle so you get to enjoy it all! Perfect for riders of all levels. Get to know your horse and learn new natural horsemanship techniques with our level 2+ horses and 4* Teri Sprague and then join Teri in the Barking Horse Farm Jungle River Trek. Start at our mountain farm, pass through multiple ecosystems at various altitudes, ride through parts of Costa Rica most tourist never get to see, to arrive at the Pacific Ocean. Fullfill your dreams of riding down the beach, swim with your horse in the warm tropical waters of Costa Rica’s Pacific ocean, discover waterfalls hidden deep in the jungle, sight a multitude of tropical birds like the magnificent Scarlet Macaw, and marvel at the incredible natural beauty that is Costa Rica. Get to know your horse and learn new natural horsemanship techniques with our level 2+ horses and 4* Nita Jo Rush and then join Nita Jo in the Barking Horse Farm Jungle River Trek. Start at our mountain farm, pass through multiple ecosystems at various altitudes, ride through parts of Costa Rica most tourist never get to see, to arrive at the Pacific Ocean. Below are some photos from this past season’s Jungle River Trek. Please check out our day to day itinerary and if you like what you see make a reservation or contact us at Barking Horse Farm. 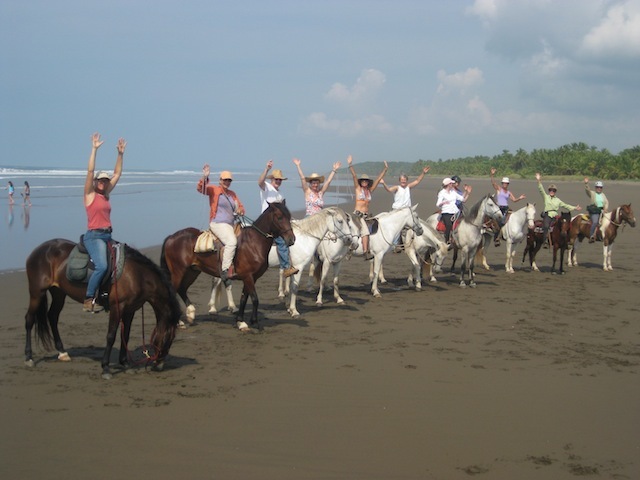 If you are looking for a place to practice the Parelli you love on a great adventure in paradise then you will want to check out the workshops and treks we are offering this coming season, December 2013 – April 2014. We have a great line up of experienced Parelli instructors. All of them have been here before and are returning again because they had such a good time with their students on the previous treks. Susan Nelson and Maurice Thibault (Dec) will be returning for another learning filled workshop taught by two instructors at once! It is always great to see how this Parelli couple work together to provide the most for their students. And think of all the support you will be getting from two Parelli professionals along the way on the Nicoya Eco Beach Trek. David Lichman’s workshops are filled with fun and music. This will be David Lichman’s 6th time back,(Jan) this time his workshop will be followed by the Nicoya Eco Beach Trek. This will be Fawn Anderson’s second time back to Costa Rica (Jan)! One of Canada’s top Parelli instuctors, she is coming to share here skills with her students on the Nicoya Eco Beach Trek. Nita Jo Rush will be returning for a third time and the fourth trek she has ridden with us (Feb). This time she will be riding her favorite trek, the Jungle River. Teri Sprague will be joining us again (March) to experience the adventure of the Jungle River Trek, having ridden the Rainforest Trek with her students last year. We are currently taking reservations for these treks. The Jungle River Trek has a rider limit of 6 and the Nicoya Trek is 8 so we highly recommend that sign up early! We hope to ride with you this year in Paradise! I just updated our Rainforest Trek page with new descriptions and pictures! This was one of our first treks ( first completed in 2005!) and continues to be one of our favorites. We love passing through so many different ecosystems all the way to the beach and staying with all the friends we have made along the way over the years is such a nice feeling. We invite you to come and join us this next season and make this trek even better with your company!